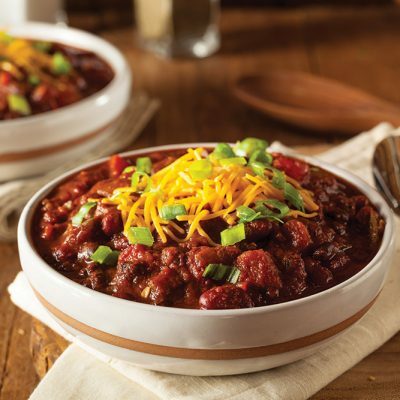 Nothing warms the insides and welcomes the cooler season better than a tasty, comforting bowl of chili. Last Saturday we served this Two-Bean Bison Chili to rave reviews during the Cycle to Farm® tour. Let us know how you like it. *For a unique twist on this recipe and a salute to our former bison office manager (and fabulous chef) Carla Burleson, here’s a delicious tip she shared. If beans are not your best friend, try cutting two medium-sized, raw, peeled, sweet potatoes into small cubes, and substitute them for the two cans of beans in this recipe. Take a deep pan or pot and heat the olive oil and sauté all the vegetables. Stir well. Add cinnamon, cumin, chili powder, salt, cayenne pepper, and brown sugar. Let it simmer for a few minutes and stir frequently. When the vegetables are soft and slightly caramelized (approx. seven minutes), add the ground Bison and stir until the meat is browned. Add the beans (or sweet potatoes) and tomatoes and stir. Fill the empty can from the diced tomatoes with water and add it to the pot. Add balsamic vinegar. Stir once more and let the chili simmer on low heat for about one hour, covered with a lid. Serve in deep plates and top with your favorite garnish. Enjoy!